It's going to happen!! Construction to start in late 2002! And it will be a FREEWAY!! 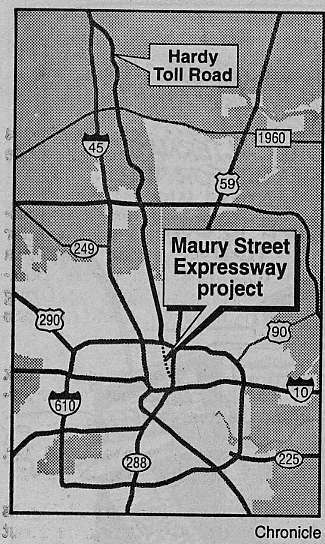 The Hardy Toll Road Extension into downtown, sometimes called the Elysian-Maury expressway, has been talked about since the early 1990's. It seemed to have momentum in the mid 1990's, but the money did not become available. The project was put on the backburner. In 1999, the Harris County Toll Road Authority awarded a contract for the design of the Hardy Toll Road Downtown Connector. In October 2000, the Harris County Commissioner's Court approved the schematic. On Febuary 22, 2001, the Texas Transportation Commission approved $17 million in state money for construction of direct connections to the new facility at IH-10. The connector will use ramps that are already under contruction at the US59/I-10 interchange. The freeway will then proceed along railroad right-of-way to the existing toll road terminus at I-610 for a distance of 3.5 miles. The tollway will have 4 lanes. Approximate cost is $70 million, including direct connectors at IH-10 and IH-610. At it's March 6, 2001, meeting, the Harris County Commissioners approved $3.6 million in engineering and construction management contracts for the project. Construction will likely begin in late 2002, with completion in late 2004 or early 2005. Also see the Hardy Toll Road photo gallery.